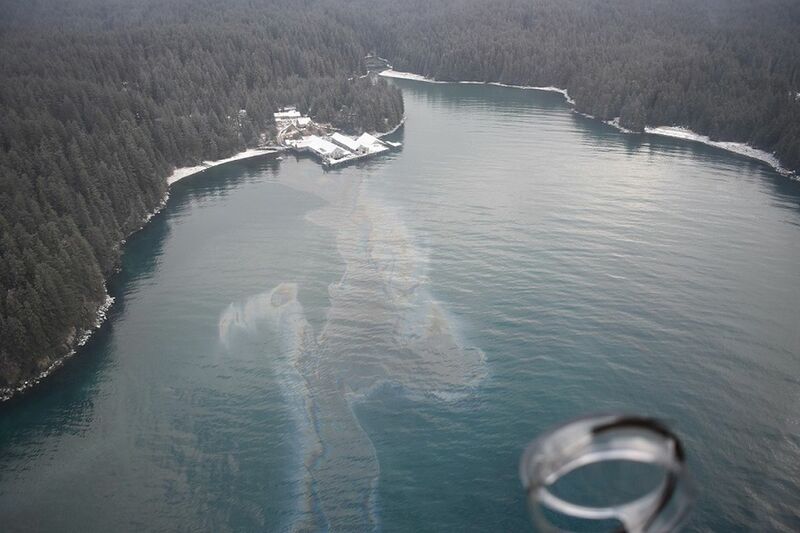 The fuel spill happened on private property at Port William on the southern end of Shuyak Island, around 50 miles north of Kodiak, at roughly 8 a.m. Monday. The facility has an extensive dock system, said Geoff Merrell, on-scene coordinator for the Alaska Department of Environmental Conservation. The section of dock that collapsed on Monday had a building containing a fuel bladder – a rubber tank used for storing fuel – that fell into the water along with the structure. Officials suspect that all 3,000 gallons of fuel oil were released into the strait, the Department of Environmental Conservation said. Images provided by the Coast Guard show a sheen on the water. Officials were still assessing the situation, said Mike Evans, an environmental program specialist at DEC.
"Impacts to wildlife are a definite high concern," Evans said. The area is designated as critical habitat for northern sea otters and Steller sea lions, which are listed populations under the Endangered Species Act. Pacific halibut, walleye pollock, Pacific cod and Pacific herring populate surrounding waters, and eagles, waterfowl and seabirds were also likely in the area, DEC said. Officials believe the fuel — fuel oil No. 6, which Merrell said is "hardly even sold anymore" — had been on the site "for a very long time." The facility had been used as a steamship depot, a floatplane base and a cannery. "This fuel was associated with at least one of those activities," Merrell said. The site's caretaker had emailed another person in Anchorage around 8 a.m. Monday, Evans said, who then reported the spill to the National Response Center around 4 p.m. Monday. "The (caretaker) believed it was the sturdiest building of the bunch," Evans said. The Coast Guard was coordinating a response along with DEC. The Coast Guard had called in Alaska Chadux to lead cleanup operations. Ten people from the company were deployed to Kodiak, but bad weather prevented the team from reaching their destination on Tuesday, Merrell said. Northwestern winds gusting 77 miles per hour were recorded at Kodiak's airport around 6 p.m. Monday, said Michael Kutz, meteorologist at the National Weather Service's Anchorage office. Winds gusting around 50 miles an hour, seas building up to 16 feet and heavy freezing spray to the west of Kodiak were causing a "rather nasty situation overall" on Tuesday, Kutz said. Northwestern winds are expected to continue through Thursday evening, he said. Merrell said clean up crews would try to reach the site again on Wednesday. Correction: An earlier version of this story said strong winds knocked a building over; the story has been corrected to say that the dock the building was sitting on collapsed.